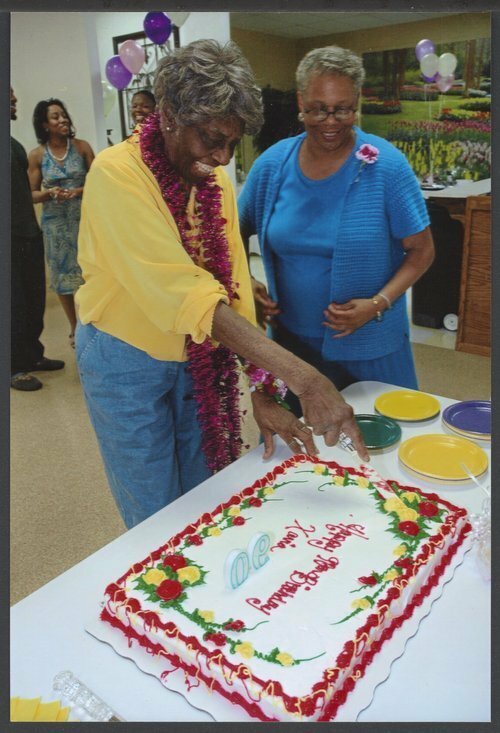 A photograph of Xavia Hightower Howard cutting a cake on her 90th birthday with her daughter Frankie Mason looking on. Xavia was born in 1916 and lived in Wichita, Kansas. Her mother Victoria Murdoch-Hightower owned and operated Citizens Funeral Home. In 1941, Xavia graduated from Williams Institute of Mortuary Science, Kansas City, Kansas. After her mother's death in 1942, Xavia became the proprietor of Citizens Funeral Home. She was the first female African-American licensed funeral director and embalmer in Kansas. Xavia was active in the community serving on many committees and boards. She retired from the funeral business in 1998.